This post is in honor of National Watermelon Day, which was August 3rd (no, we're not making this up). Did you know that watermelon, which is 92% water, is the lycopene leader in fresh produce, having higher concentrations of lycopene than any other fresh fruit or vegetable? Lycopene is one of the most potent carotenoid antioxidants. Watermelon is also an excellent source of vitamins A, B6 and C; provides fiber and potassium; and has no fat or cholesterol. 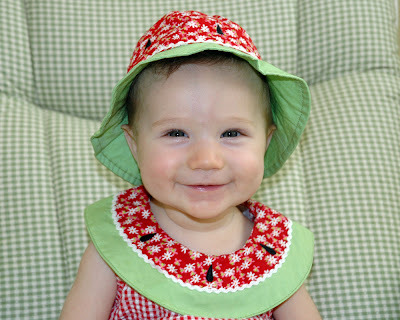 A recent study published March 2007 by the United States Department of Agriculture (USDA) showed a strong relationship between watermelon consumption and several heart healthy benefits. The first recorded watermelon harvest occurred nearly 5,000 years ago in Egypt. Today, more than 1,200 varieties of watermelons are grown worldwide in 96 countries. Thanks a "melon" for sharing such great pictures and information. 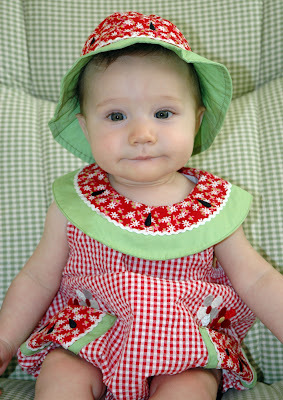 Our little melon is the cutest one I've seen. We love watermelon; who knew that it was so good for you? Costco has the best watermelons anywhere! 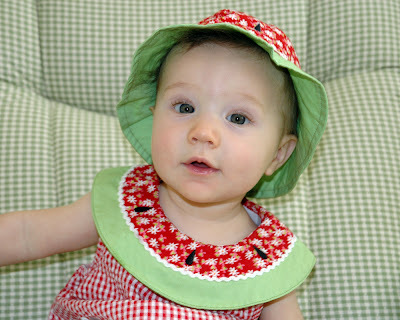 Ava looks like a "melon" dollars! 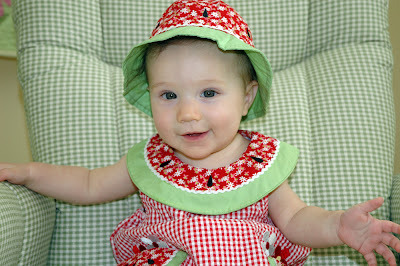 Ava is a darling little watermelon. she looks so cute. A Wolf in Baby's Clothing?